Modern-day acrylic paints were commercialised in the 1950’s, and quickly took off as a significantly better option than the oil and lead based paints available at the time: healthier, cheap and easy to use. Mineral paints were invented in the late 1800’s in Germany, long before acrylic paints, however they have only been commercially available in the UK for around the last 20 years. While acrylic paints effectively glue themselves to the surface, mineral paints soak into the surface and form a strong chemical bond through a process called silicification, adhering to the silica in the substrate itself. Acrylic paints and their bond with the substrate slowly breaks down over time and they eventually start to discolour, flake or lift off after cleaning and through weathering, ultimately reaching a point where they become unsightly and require recoating. Mineral paints by comparison due to their chemical bond don’t break down over time, are extremely lightfast and hard wearing, and aside from natural weathering offer unsurpassed durability. In an environment where an acrylic paint lasts 5 years a mineral paint should last 10. In an environment where an acrylic paint gives you 10 years, a mineral paint will last almost indefinitely. While all mineral paints bond with the substrate, Beeck have a range of paints that take this a step further. Through a process known as active silicification (A.S.F) they form a permanent chemical bond with the substrate, etching into and essentially becoming part of the background so they cannot be removed. Beeck is the only brand to offer active silicate paints, and all binders, pigments and additives used are derived from natural materials. Not all mineral paints can claim this. Beeck Mineral Paints contain extremely low VOC’s, are free from chemicals and additions, produce no hazardous waste or by-products, and can be fully recycled. They are naturally alkaline and therefore resistant to mould growth, and naturally fire proof due to their mineral composition. Beeck paints are also fully breathable; that is, they are fully vapour open and allow moisture to pass through the paint. This means rather than moisture being trapped in the wall it is able to escape, which is essential for older buildings (solid wall construction). Where condensation is likely to occur it can also reduce mould growth, beneficial for both historic and contemporary construction. Used with the right primer, Beeck Mineral Paints are suitable for virtually any surface. For lime work, historic masonry and solid wall construction, only mineral paints can offer a long term durable finish. Acrylic paints are designed to seal the surface and are therefore trap water within the fabric, while lime washes have a low resistance to weathering and abrasion. For modern or contemporary construction, Beeck Mineral Paints still allow for vapour movement where moisture build up occurs, making for a healthier environment. They also offer an environmentally friendly, low VOC, extremely durable and healthy finish suitable for homes, public spaces, schools, hospitals and hyper allergenic environments. The initial purchase costs for acrylic paints may be lower when compared with mineral paints, however the whole life cost will likely be significantly higher. With ongoing maintenance and recoating, not to mention labour and scaffolding costs, any initial saving is quickly eroded. Due to their chemical bond and high durability the maintenance for a mineral paint is relatively simple. The coatings are resistant to pressure washing (background dependant) and cleaning agents, they can be regularly cleaned and maintained with little hassle. When it comes to recoating a Beeck Mineral Paint, a clean down of the surface and one coat of the same coloured paint is all that is usually required. Externally, Beeck Mineral Paints have been proven to exceed 10 years even in severely exposed conditions, which allows for simple maintenance cycles and budgeting. Internally a mineral paint will far exceed this timescale and will likely last as long as the background remains intact. Beeck external paints are fully vapour permeable, suitable for application onto any external masonry with the correct preparation or primer. Due to silicification, Beeck Mineral Paints will comfortably outlast any conventional paint coating, even in the most testing environments. Beeck’s external range of mineral paints also contain the addition of a hydrophobe. Whilst not completely waterproof, it repels liquid to significantly reduce the levels of water from entering the building fabric. This addition further protects the building and allows it to dry much quicker during wet spells, providing an additional layer of security. Beeck Renosil – Standard external mineral paint that can chemically bind to mineral surfaces, as well as existing masonry coatings. Renosil offers a long lasting, vapour permeable and water repellent coating. Renosil can support the full Beeck colour range. Beeck Beeckosil – Superior external mineral paint for mineral surfaces, silicification active (A.S.F. ), offering a true chemical bond to the substrate. Beeckosil offers the highest vapour permeability and durability for an external mineral paint. Beeckosil can support the full Beeck colour range. Beeck S P Plus – Clear, vapour permeable, water repellent treatment for bare mineral surfaces such as stone and brick. S P Plus offers all of the benefits of the Beeck exterior mineral paints within a clear coating to retain and maintain the appearance of the natural mineral finish. The Beeck internal paint range is fully vapour permeable, hard wearing, environmentally friendly and can be used on virtually any background with the correct primer. 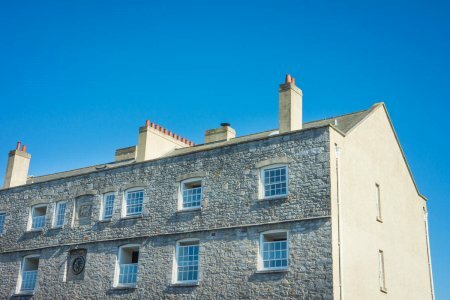 Suitable for both historic and modern buildings, Beeck paints can help regulate humidity, achieving a healthier internal climate as well as offering unsurpassed durability. Beeck Insil – Standard internal mineral paint, offering a good durability, high vapour permeability and a reasonable scrub resistance at cost effective pricing. Available in white, colour group 1 and 2. Beeck Maxil – Offers an improved scrub resistance and coverage compared to Insil and is able to support the entire range of Beeck colours, from white through to colour group 4. Beeck Sensil – Silicification active so offers the highest scrub resistance of all Beeck internal paints and is designed to offer maximum durability and longevity, whilst retaining all of the benefits associated with Beeck paints, including full vapour permeability and made from natural materials. Available in white, colour group 1 and 2. 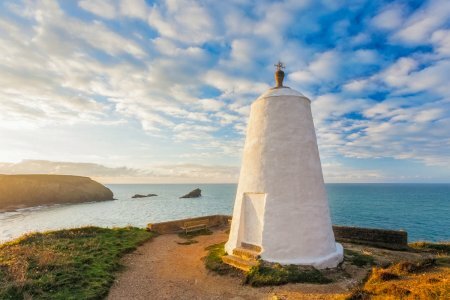 This listed chapel sits within a small coastal village that is designated as an Area of Outstanding Natural Beauty and is situated less than 100 meters from the sea. Due to its location the chapel is subject to heavy wind driven rain and the area is classified as severely exposed. 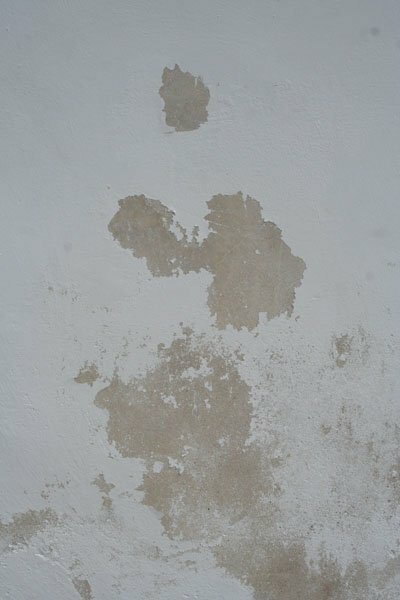 5 months after application of five coats of Limewash. 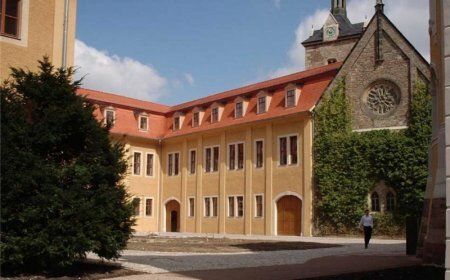 The external façade of the chapel was renovated, given the exposure and the requirement of a vapour permeable paint, an application of Beeckosil was suggested. However a lime wash was specified and 6 coats were applied. Lime wash, whilst perfectly suitable for its vapour permeability, was unable to withstand the harsh climate and had virtually been removed through weathering within 6 months. 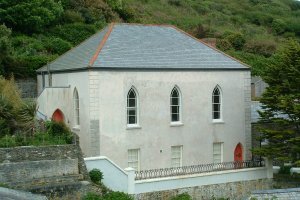 Following the limited durability the limewash coating offered, the render was then cleaned back and Beeckosil was then specified as a suitable alternative paint coating. This image below on the left shows the building immediately after Beeckosil had been applied. The image below on the right was taken 12 years later with the initial Beeckosil coating intact and still offering the same performance as it did from the original application. While the render has developed some signs of bio/mould growth, which is due to the close proximity of the tree, this can be easily removed with an appropriate fungicide. 12 years later in an extreme coastal location and still going strong. 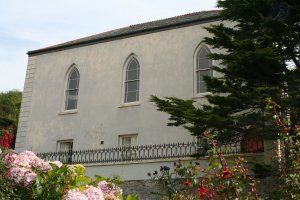 Finished image showing the successful application of Beeckosil on to the exterior of the Chapel. Can you tell me if any Beeck paint(s) are suitable for use on a shower wall (that will be made of plasterboard skimmed with lime plaster)? The Beeck paints are suitable for use over both lime and gypsum plasters with the correct primers. My only concern here would be the wall build up itself, plasterboard does not like being in contact with water and if finished with a lime plaster and then a vapour permeable paint this could lead to long term issues or perhaps failure. Bathrooms can be a difficult area when it comes to lime and it may pay to use something like aqua panel, whilst not breathable this is waterproof and then this can be decorated or tiled accordingly, or use a breathable system where the background/wall build up is breathable and water/moisture is able to transfer/escape. If you have any questions or would like to discuss this in more detail please contact us on 01208 79779. Have you considered Moroccan polished lime plasters.....ideal for wetroom situations, and all lime of course. Hi - i have a stone building which has been painted previously with a plasticated paint. We have got most of the paint off, especially where it was covering the pointing; however there remains some paint on the stone which is very difficult to get off. Would it be okay to apply the mineral paint to the wall? Of course we will re-point the joints before doing so. Thank you. We would recommend using the Beeck Renosil Mineral Paint System as this has been specifically designed for this type of application. Renosil has the ability to chemically bond to both bare mineral surfaces (i.e. stone, mortar joints) and existing masonry paint. It would be advisable to clean the surface with some form of fungicide to ensure that their are not contaminates (algae, mould etc.) present and this could be followed by a primer coat of Beeck Fixative, applied to the bare areas, then a coat of Renosil Coarse and Renosil Fine. The reason for using the coarse base coat is that it will help hide the areas where the existing paint may be, as these areas will be a different texture/finish they can stand out once the new paint has been applied. If you have any questions please give us a call on 01208 79779. 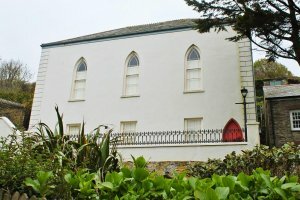 I have a solid wall to paint(outside) would like to use limewash but unsure about existing coating. (looks and feels like acrylic resin) How do I know for sure that it isn’t limewash before I go any further. Thanks. There are a few ways to check if the paint is modern, firstly I would recommend spraying the wall with water and see how this reacts with the surface, if there is no absorption this would suggest that it is a modern coating. Modern paints tend to have a 'plastic' like feel, whereas lime wash can be dusty (not always if additions have been used). You could attempt to remove a small section of the paint or use a paint stripper, a modern paint would peel whereas a lime wash wouldn't. I have seen people also carefully take a blow torch or heat gun to a section of the paint and if it melts or becomes sticky this would also suggest that it is a modern coating. If there is a modern coating present a lime wash would be unable to sufficiently bond to this, so would be unsuitable. If you would like to discuss this in more detail please contact me on 01208 79779. What manufacturer would you recommend between Beeck and St Austier for a limewash paint onto exterior cob walls and why.? The two paints are completely different in formulation and work in a different way. The St. Astier Lime Paint is closer to that of a traditional lime wash and is made using lime and other additives. The benefit of lime paint over lime wash is that it will usually require fewer coats and offers an improved durability. Lime based paints work by being applied over numerous layers to build up a coating, and they are seen as a sacrificial layer which will need re-coating periodically (depending on exposure, weathering etc.). The higher number of coats, will provide more protection. Lime based paints are not water repellent and will take in and release moisture. Beeck Mineral Paints are based of potassium silicate and work by being absorbed into the background and forming a chemical bond with any silica present. This chemical bond results in superb longevity and durability and a more stable colour. Beeck Mineral Paints also contain water repellents and keep the underlying layer protected from water ingress. Both are suitable for historic buildings as both are vapour permeable and will work in conjunction with lime renders. Both paint treatments work best on bare, unpainted render, however Beeck do have a range of exterior paints which can be applied over existing coatings. As both paints are different it is difficult to compare or recommend one over the other. Beeck will be a more expensive paint initially (higher material costs) but will offer unrivalled durability and should offer a much greater long term saving. Whereas lime paints will initially be cheaper to purchase but will require maintenance and further re-coating. A lime paint will last anywhere from 3 to 5 years (on average), Beeck Mineral Paint should comfortably exceed 10 years, even in exposed locations. Both paints are suitable, but we would likely recommend the Beeck systems due to their longevity and water repellent finish. If you have any questions or would like to discuss the paints and your application in more detail please contact me on 01208 79779.